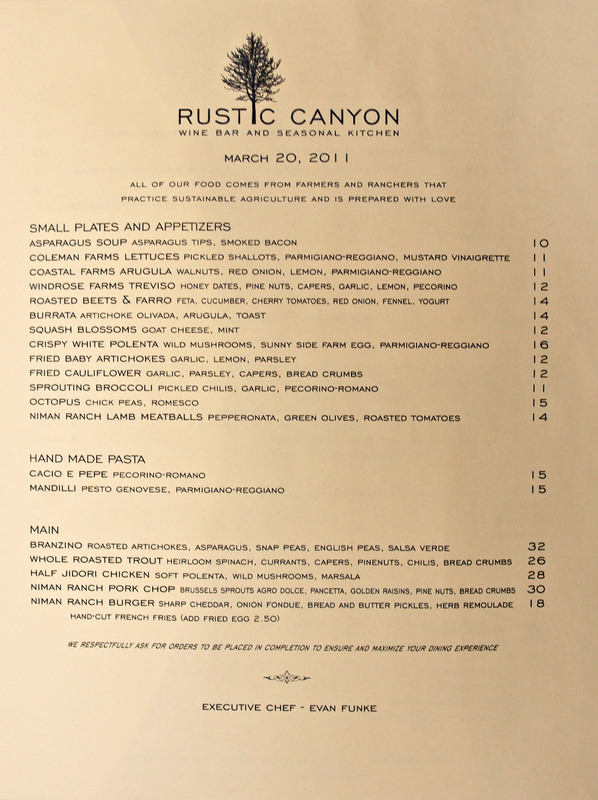 Rustic Canyon represents the handiwork of one Josh Loeb. Loeb started out in the publishing industry, working in New York as a copy editor and researcher for a number of magazines. However, the job grew wearisome, and he soon returned home to Los Angeles. He was able to land a job managing wine at Broadway Deli, and later worked a stint at Bruce Marder's Capo. During this time, Loeb even started hosting intimate private dinners at his "treehouse" residence in the Santa Monica canyons. 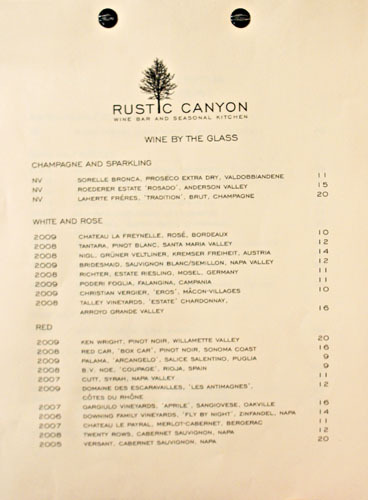 He fell in love with the casual cooking, and opened Rustic Canyon in December 2006 with partner Pamela Kasdan as an extension of this underground supper club. Loeb tapped Samir Mohajer (formerly of Axe and The Little Door) to be his Executive Chef, and the two set off to create a seasonally-driven farmers' market menu. 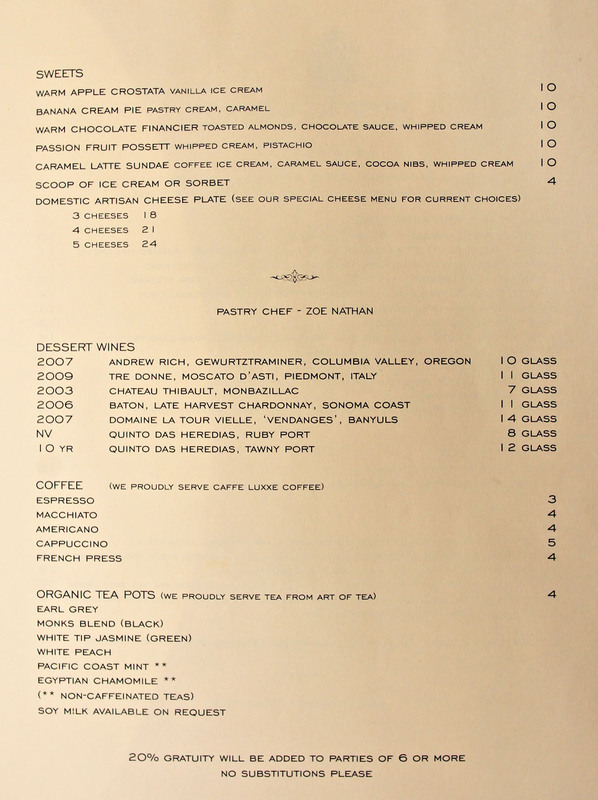 To head up the pastry department, Loeb wooed Zoe Nathan (Joe's, BLD, Tartine, Jardiniere, Lupa), who was already working at Mark Peel's Campanile at the time. Not too long after, Loeb wooed Nathan again, but in a different way. The two quickly started dating, and later got married at the restaurant in early 2009. Things were doing well for Rustic Canyon until the middle of 2008, when Mohajer decided to leave (he would later open a string of Cabbage Patch restaurants). He was replaced by the current Executive Chef, Evan Funke. About the Chef: Funke, for his part, is a native Californian who grew up cooking alongside his mother. He eventually enrolled in the Le Cordon Bleu program at Pasadena's California School of the Culinary Arts. Early on during his studies at the CSCA, Funke took on a position at Wolfgang Puck Catering, working under chef Michael Beglinger (of Larchmont Larder fame). After cooking there for two years and graduating from culinary school, he secured a job at Puck's seminal eatery Spago. During his three years at Spago, Funke was mentored by none other than Lee Hefter, and eventually rose to the rank of chef de partie. He left Spago in early 2006 and decided to take on a teaching role back at his alma mater, but that gig would only last until early 2007, due to his "unconventional" teaching style. 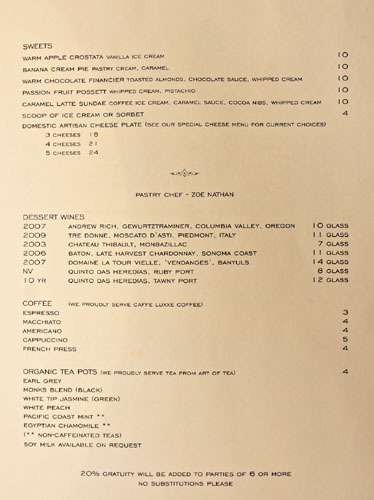 Funke then moved on to Beverly Hills' Avalon hotel, where he became Chef de Cuisine. He hated it there though, and left in January 2008. His destination this time was Bologna, Italy. The Chef stayed there for three months, mastering the intricacies of hand-made pasta. 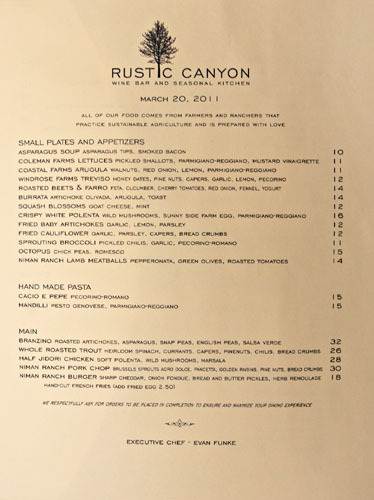 Upon returning Stateside, Funke tried out for the Exec Chef role at Rustic Canyon, got hired on the spot, and the rest is history. 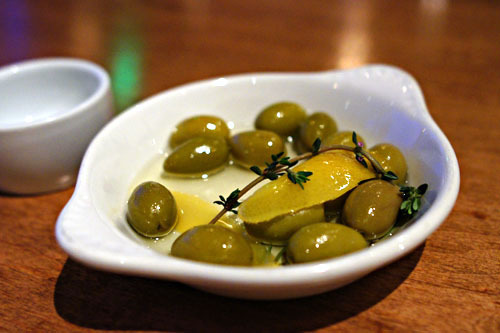 A complementary plate of olives to munch on while perusing the menu. 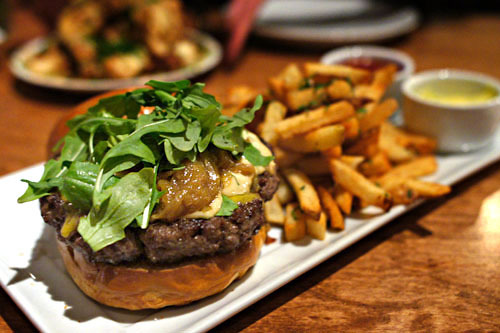 Funke's seasonal-rustic-Mediterranean menu is dominated by the small plates, so try to order more of those and share. The food is complemented by a healthy sampling of boutique wines by the glass, as well as a changing selection of Mionetto Prosecco-based sparkling cocktails. Click for larger versions. 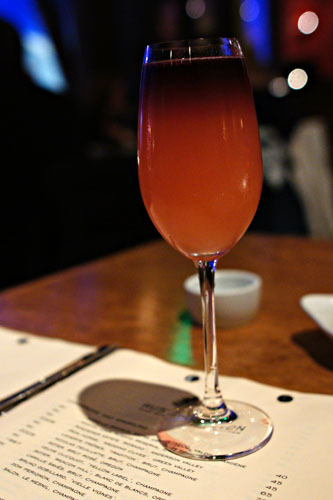 I first ordered up a Rustic Sunset, which demonstrated a delicious base of grapefruit-y sweetness, accented by a lovely bit of vinous gravity from the red wine. The meal got off to a wonderful start with one of the best preparations of octopus that I'd had in a while. The cephalopod was wonderfully tender, with an immensely satisfying savoriness and an almost sausage-like character. 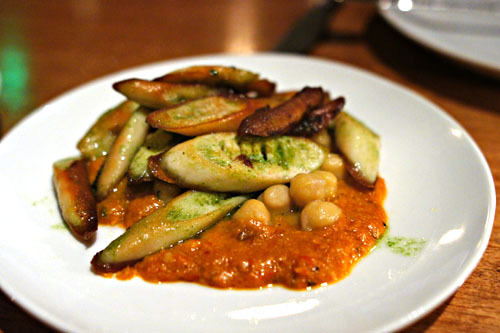 It went swimmingly with the piquant smack of the accompanying romesco, and I loved the tempering earthiness of those garbanzos as well. 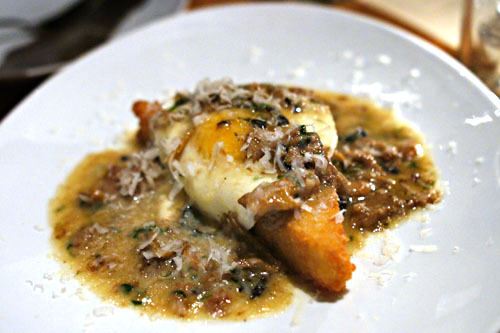 I pretty much have to order anything that advertises a runny egg, hence this polenta. I rather enjoyed the dish though, finding the textural variation in the fried cornmeal particularly engaging. It served as a wonderful base to the dish, allowing the umami-tinged relish of the mushrooms, lusciousness of the egg, and salty kick of the Parmesan to really sing. Nice! Now on to the pasta. Up first was mandilli (literally "handkerchiefs"), which I don't believe I've encountered before. Think of it as tossed lasagna sheets. 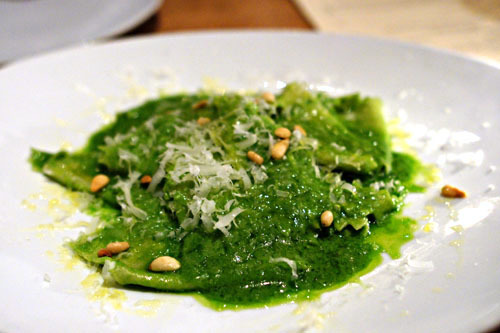 The pasta, nicely supple and silky in consistency, was served with its traditional accompaniment of pesto, which gave the dish a delectable basil-y tang, augmented by the additional weight of the Parmigiano, while the bits of pine nut perked things up texturally. Cacio e Pepe translates to "cheese and pepper," so it's not surprising that these two elements formed the focal point of this dish. 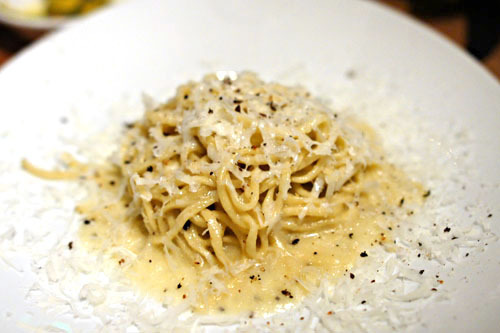 Spread over a pleasingly al dente rendition of housemade spaghetti, the tang of the black pepper and the lusciousness of the Pecorino played beautifully off of each other. A simple concept, but thoroughly effective. Some bread was brought out to sop up the remainder of that lovely pesto liquid. 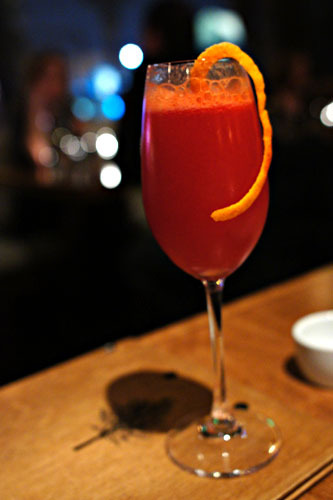 My next sparkling cocktail was teeming with juicy blood orange sweetness, with just a touch of tempering complexity from the bitters. Think adult fruit punch! And now, the pièce de résistance. I really enjoyed the interplay between the cheddar and the beef, and how the pickles and arugula helped to balance the weight of the meat. I even liked the onions, which were thankfully restrained in their sweetness. Overall a balanced burger; my only issue was that I wanted more succulence, more beefiness from the patty. As for the fries, simply mahvelous. 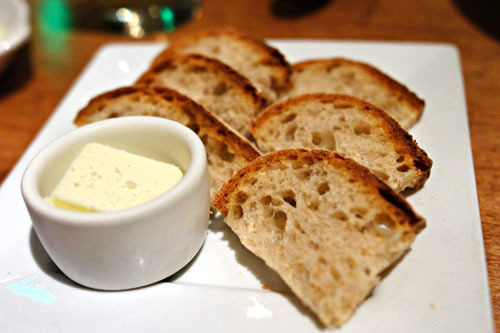 We paired this with a glass of the 2005 Versant, Cabernet Sauvignon, Napa [$20]. I'm a bit of a cauliflower fiend, so this dish was a natural side to the burger. 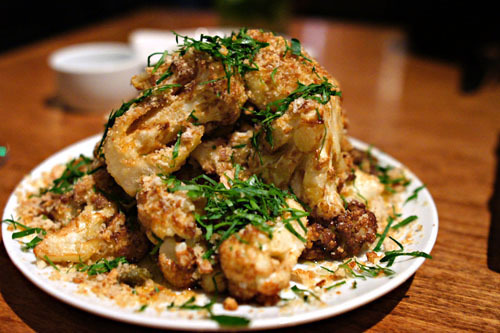 The cauliflower showed off a nice fried flair, but still retained its tenderness, while the parsley and capers added some additional complexity to the otherwise subtle vegetable. Desserts here are the charge of Zoe Nathan, while cheese are selected by Andrew Steiner of Andrew's Cheese Shop. Of course, Nathan also runs things over at Huckleberry (a casual bakery-cafe opened in February 2009), and manages Sweet Rose Creamery at the Brentwood Country Mart with Shiho Yoshikawa. Click for larger versions. The financier was as you'd expect, albeit a bit dry, with a rich chocolate-y goodness contrasted by the relative levity of the whipped cream, while the almonds added some nutty complexity to things. We ended with a posset of passion fruit, which showed off a rather bracingly tart sweetness tempered by the dessert's topping of whipped cream. 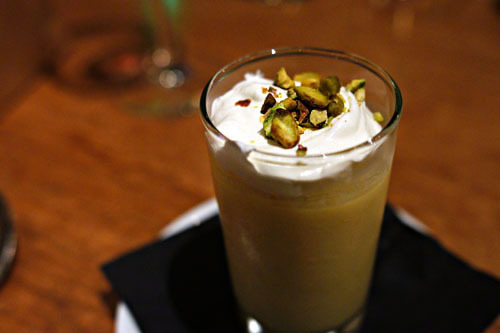 I appreciated the use of pistachios, which added a touch of savory flair to the mix. All in all, quite a nice showing from Funke and company--a tasty celebration of Cal-Med flavors and rustic, homey cooking executed with an eye toward local/seasonal/sustainable, all in a neighborhood restaurant type of environment. One of my new favorite places in Santa Monica! if this place wasn't so far from downtown, it'd quickly become a weekly stop for me. 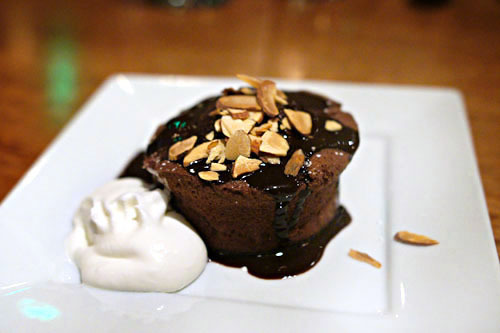 There's something about warm chocolate desserts that melts my heart... :) Especially when paired with ice cream! You made me make a reservation for tonight :-) it's so local. Although I've already blogged about it like three times. Stephanie: Me too! I take it that the polenta's one of their standby dishes. Jennifer: Yeah it's a classic combination--hard to go too wrong with it. Andy: Ha! So how was it? Kevin: Here's the meal that resulted. There were only two of us, so there aren't so many dishes, but it was very good as usual, and there are links in the post to three other RC meals (with more people). Andy, it looks like it was still quite bright outside. Why did you still use the flash?